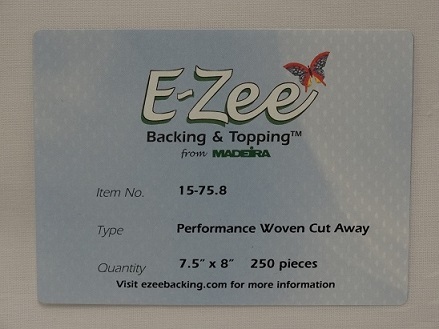 E-Zee Cut® Performance Backing is low profile, with the sturdy construction of a true woven fabric. This makes it ideal for unstable fabrics. The low profile, high stability of this product works especially well with performance wear garments and any other thin, slippery fabrics. Use with high performance wear, knits, & loosely woven fabrics. Great for designs up to 8,000 stitches. Two pieces may be used for larger or more dense designs. Made of 80%Polyester 20% Rayon.